Telling the difference between imitation pearls and the real ones is quite simple: the tooth test. When you rub a real pearl across your teeth, the pearl will feel slightly gritty. Do the same with a fake and it's likely to feel smooth and slippery. If you're still having trouble deciding whether it's real, ask the vendor to scrape the pearl with a knife. Powder will result in scraping a real pearl, a white plastic bead will be revealed from a fake pearl. Some say offer 10% of what the vendor is asking, some say 25% and work up from there. In my experience, the best thing to do is make some snap decisions and then start the negotiations at the low end. Decide if you really want it. It's hard to extract a real price so you'll have to bargain to get close. Decide how much you're willing to pay. How much is it worth to you? Walk away. Sometimes it works...but be prepared for a tinge of disappointment when it doesn't. Most of the pearls you'll find in China are freshwater pearls, cultivated in mollusks in lakes and rivers. Their shape can be elongated and their appearance milky translucent. Freshwater pearls are certainly the real value when buying pearls in China, but sea water and South Sea pearls are also good values. In addition to pearls, there's seemingly no end to the semi-precious stones you can add to designs, such as jade and turquoise, as well as inexpensive crystal and plastic beads. 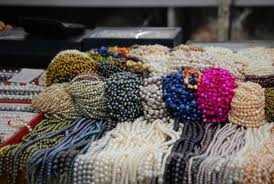 There are two other wholesale pearl markets in Shanghai that are worth a stop if you're a real pearl-a-holic. The information above applies to these markets as well.